Yoozbashi, M., Hajiloo, T., Akbarzadeh, E., Yazdani, S. (2017). Mechanical Stability of Retained Austenite in the Nanostructured, Carbide Free Bainitic Steels During Tensile Testing and Cold Rolling Process. International Journal of Iron & Steel Society of Iran, 14(2), 27-32. M. N. Yoozbashi; T. Hajiloo; E. Akbarzadeh; S. Yazdani. "Mechanical Stability of Retained Austenite in the Nanostructured, Carbide Free Bainitic Steels During Tensile Testing and Cold Rolling Process". International Journal of Iron & Steel Society of Iran, 14, 2, 2017, 27-32. Yoozbashi, M., Hajiloo, T., Akbarzadeh, E., Yazdani, S. (2017). 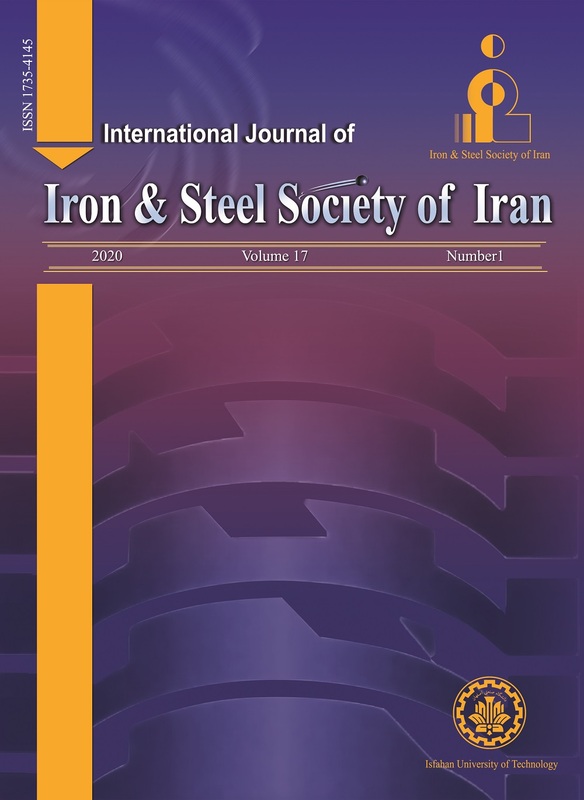 'Mechanical Stability of Retained Austenite in the Nanostructured, Carbide Free Bainitic Steels During Tensile Testing and Cold Rolling Process', International Journal of Iron & Steel Society of Iran, 14(2), pp. 27-32. Yoozbashi, M., Hajiloo, T., Akbarzadeh, E., Yazdani, S. Mechanical Stability of Retained Austenite in the Nanostructured, Carbide Free Bainitic Steels During Tensile Testing and Cold Rolling Process. International Journal of Iron & Steel Society of Iran, 2017; 14(2): 27-32. Terms of service of the steels with retained austenite in the microstructure, is severely depended on the stability of austenite during the course of deformation. The present work aims to evaluate the mechanical stability of austenite in nanostructured, carbide free bainitic steels during tensile testing and cold rolling process. To achieve the microstructure with retained austenite, the steel with chemical composition of (in wt.%) 0.76C-1.95Si-1.4Mn-0.12Ni-0.24Mo-0.69Al isothermally transformed at temperatures of 200, 250 and 300°C for 6, 16 and 72 hours, respectively, after austenitizing at 950°C for 30 min. Austenite stability was evaluated by means of microhardness testing, x-ray diffraction pattern analysis and color metallography. Further study was carried out by comparing the incremental work hardening exponent obtained from the stress-strain curve. According to the results, austenite transforms into martensite in a progressive manner; blocky austenite at the early, but filmy austenite at the later stage of deformation. Samples transformed at the 300 °C have a good capability of retained austenite to martensite transformation. This is as a result of the higher mechanical stability of the austenite in this microstructure. F.G. Caballero, H. K. D. H. Bhadeshia, J. A. Mawella, D. G. Jones and P. Brown: Mater. Sci. Technol., 18(2002), 279. C. Garcia-Mateo, F. G. Caballero and H. K. D. H. Bhadeshia: J. Phys. Colloq., 112(2003), 1238. C. Garcia-Mateo, F. G. Caballero and H. K. D. H. Bhadeshia: ISIJ. Int., 43(2003), 1821. C. Garcia-Mateo, F. G. Caballero and H. K. D. H.Bhadeshia: ISIJ. Int., 43(2003), 1238. F. G. Caballero and H. K. D. H. Bhadeshia: Curr. Opin. Solid. State. Mater. Sci., 8(2004), 251. C. Garcia-Mateo, F. G. Caballero and H. K. D. H. Bhadeshia: Mater. Sci. Forum, 500-50(2005), 495. H. K. D. H. Bhadeshia: Conf. on Solid, Solid Phase Transformations in Inorganic Materials, TMS, Arizona, USA, (2005), 469. H. K. D. H. Bhadeshia: Mater. Sci. Forum, 500-501(2005), 63. M. N. Yoozbashi and S. Yazdani: Mater. Sci. Eng. A, 527(2010), 3200. M. N. Yoozbashi, S. Yazdani and T. S. Wang: Mater. Des., 32(2011), 3248. O. Kazum, M. Bobby Kannan, H. Beladi, I. B. Timokhina, P. D. Hodgson and S. Khoddam: Mater. Des., 54(2014), 67. S. S. Babu, S. Vogel, C. Garcia-Mateo, B. Clausen, L. Morales-Rivas and F. G. Caballeroc: Scripta. Mater., 69 (11-12)(2013), 777. H. K. D. H. Bhadeshia, Materials Algorithms Project,http://www.msm.cam.ac.uk/map/ steel/programs/ mucg83.html. ASTM E08: 2000, Standard test methods for tension testing of metallic materials. ASTM E975-03: 2008, Standard practice for x-ray determination of retained austenite in steel with near random crystallographic orientation. J. Kilpatrick, A. Benscoter and A. Marder: Met. Prog., 100(6) (1971), 79. G.F. Vander Voort: Heat Treating Progress, 1(2)(2001), 25. G.F. Vander Voort: ASM Handbook: Metallography and microstructures, ASM International, 2004. M. Y. Sherif: PhD thesis, Cambridge University, (2005), https://www.phase-trans.msm.cam.ac.uk/2006/ mohamed_phd_thesis.pdf. B. Avishan, S. Yazdani and S. H. Nedjad: Mater. Sci. and Eng. A, 548(2012), 106. C. Garcia-Mateo and F. G. Caballero: Mater. Trans., 46(8) (2005), 1839.